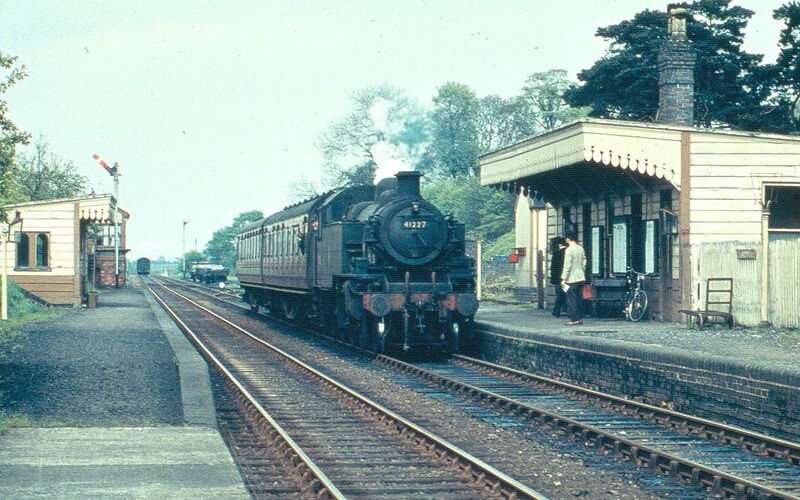 British Railways built 2MT 2-6-2T No 41227 has just passed classmate No 41228 at Dunchurch station on 2nd May 1959. Both locomotives are coupled to the Leamington end of their respective trains as they are operating in 'Push-Pull' mode. 'PushPull' describes a configuration for locomotive-hauled trains, whereby they can be driven from either end of the train, from a locomotive at one end and by a driver in a specially adapted coach at the other end. Control from the adapted coach, often referred to as a 'Driving Trailer', was by rodding and a mechanism which allowed the driving compartment to be either one or two carriages-distant from the locomotive.